A homewares shop just off the top of Brick Lane, in Shoreditch. 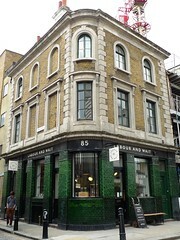 It was located on Cheshire Street until around 2011, when it moved into its present site (a former pub building). This isn't a shop from the Victorian era, but it certainly has the feel of a place untouched by modern technology. Everything it sells is either a tried-and-tested design classic, or a lovingly recreated slice of times past. There are no trendy gadgets, but plenty of gift ideas. The materials on show are traditional ones, with such things as wooden broomsticks and brushes, paraffin lamps, aluminium watering cans and buckets, enamel kitchen goods, wooden children's toys, reprints of antique books. Much of it can be found on their website and is available for mail-order. Staff wear aprons, and goods are carefully wrapped in tissue paper and packed into brown paper bags. Service is friendly. Prices aren't cheap, but the goods on sale are sturdy and likely to be long-lasting, so may be considered good value. Last visited by bob, July 2015. Last edited 2015-07-12 16:33:01 (version 6; diff). List all versions. Page last edited 2015-07-12 16:33:01 (version 6).